This hotel is located in the heart of downtown Calgary at 700 Centre Street SE. We stayed here for two nights in September of 2015 for a work function. The Hyatt is in a great location. It is easily accessible by the LRT or “C-Train,” as it is otherwise known, and there are several restaurants and shops very close by. The hotel is right on Stephen Avenue (popular spot for restaurants, bars and shops) and the famous Calgary Tower is about a block away. The hotel had on-site parking, although it was full when we arrived at the hotel. If you can get in early in the day, you are more likely to find parking here. The hotel also offered valet parking, which was considerably more expensive. 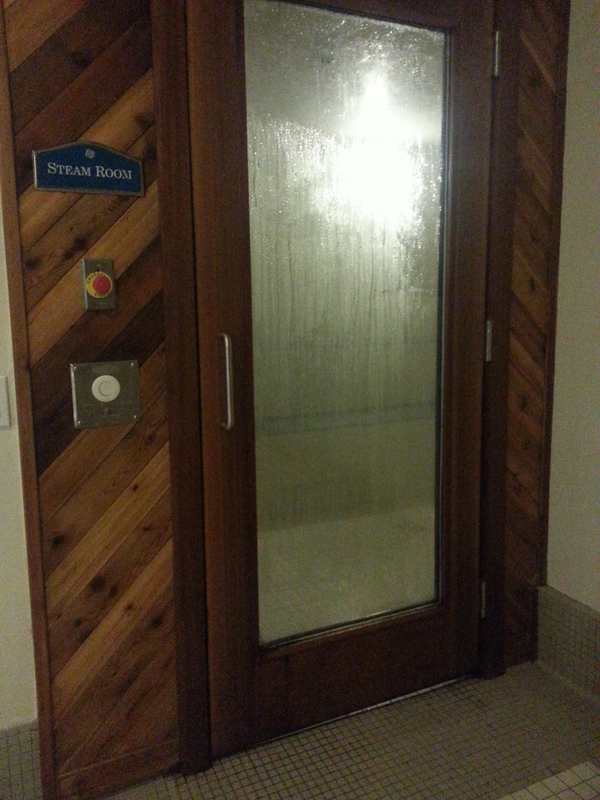 There was a beautiful pool, hot tub, steam room and gym located on the 18th floor of the hotel. 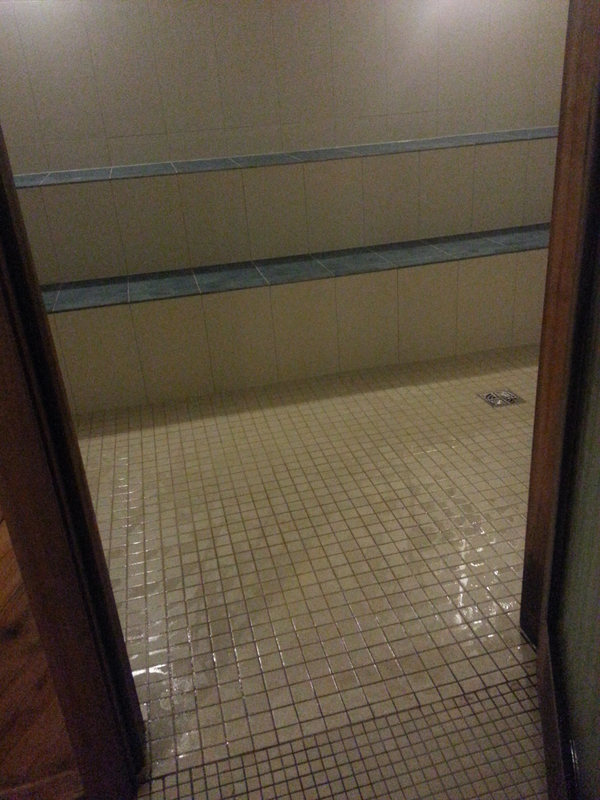 This entire area was wheelchair accessible, including the steam room. Although there was no pool lift, one could bounce down into the hot tub or pool. There were steps in both pools that one could sit on or use to bounce in and out of the water. Our accessible room (on the 10th floor) had a wheel-in shower, wheel-under sink, toilet with grab bars, king-sized bed, TV, mini-fridge, desk, chair, ironing board, iron and a coffee machine. 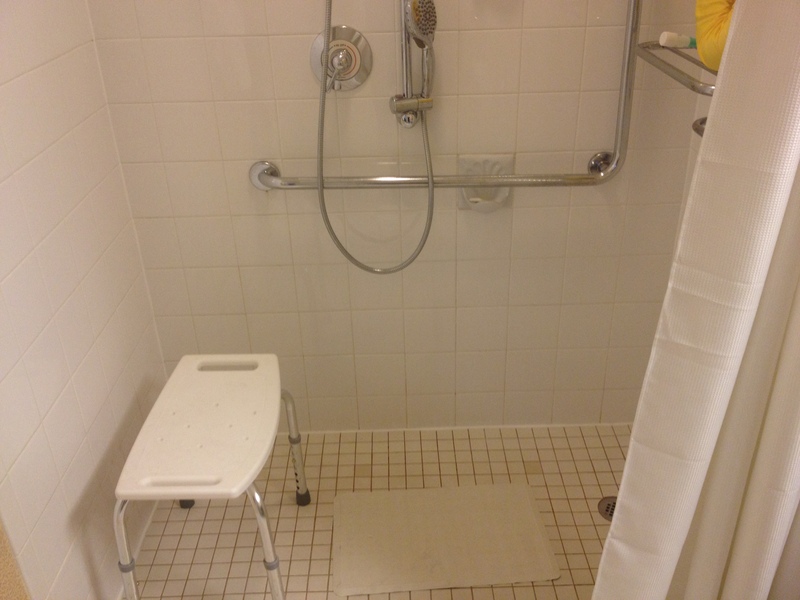 Upon request, the hotel provided a portable shower bench and a raised toilet seat. The bed was comfortable and we had no issue getting two play-pen style cribs upon request. 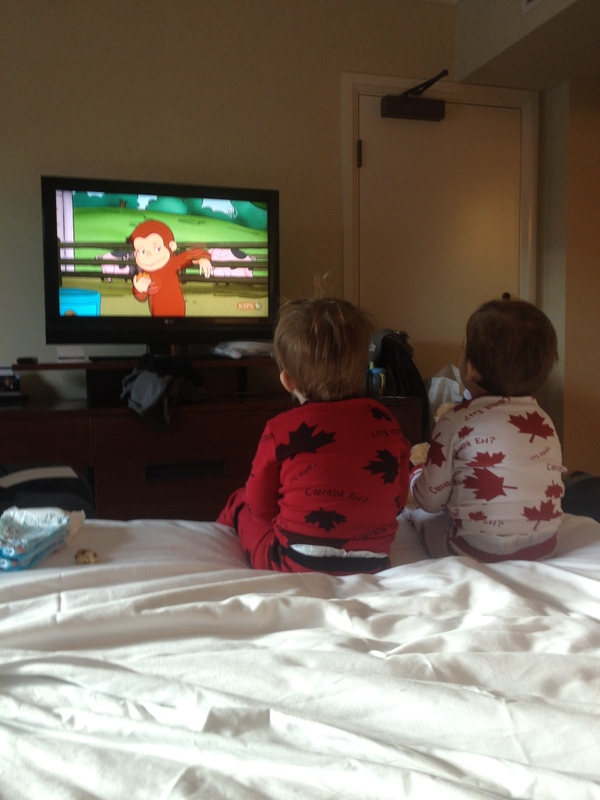 There was no breakfast included with the room, which is always a negative, particularly when you travel with kids. There was no microwave in the room for re-heating leftovers or making a hot breakfast. 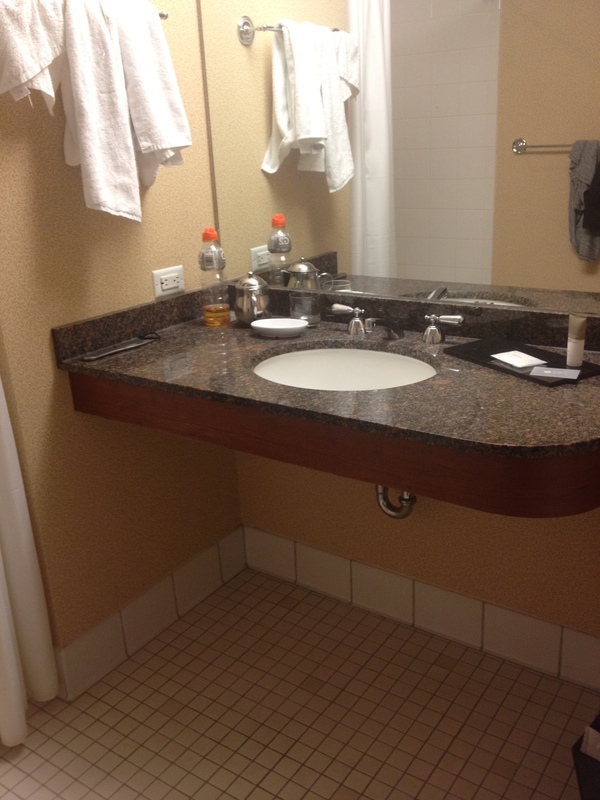 The bathroom in our room, although accessible, was really outdated. It could definitely use some new tile and a paint job. The portable shower bench provided by the hotel was very small. It would have been a lot easier if the shower had a built-in shower bench. 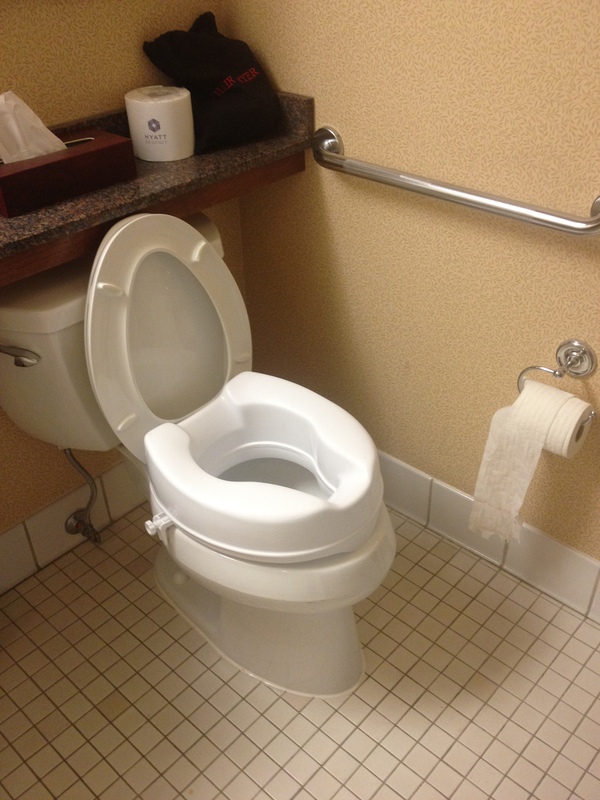 The toilet was very low without the raised toilet seat attachment, so be aware that you will likely have to ask for one or bring your own. Although it is very common, I always view it as a negative when accessible rooms have no bathtub. I understand that they only have so much space, but it is always nice for the kids when there is a bathtub. While we were at the hotel, there was a huge convention going on. There were several parties being held by the convention attendees in their hotel rooms and it was extremely loud on our floor at night. This is not likely to be the case all the time but the Hyatt is a popular location for retreats and conferences. The Hyatt is a nice hotel and there was nothing ugly I noticed about it. There are lots of positives about the Hyatt. 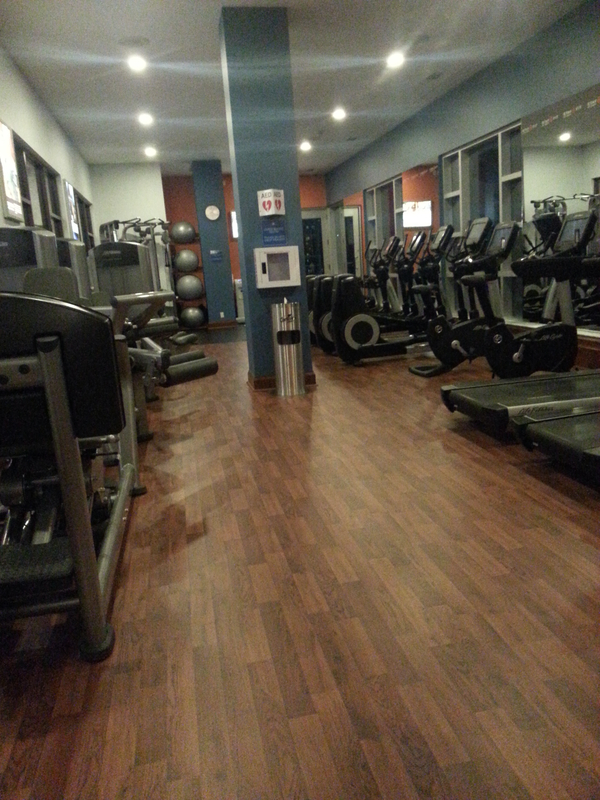 It is in a convenient downtown location and the staff is helpful and accommodating. For accessibility, it meets all of the basic criteria. In my opinion, however, this hotel is overpriced for what it is. There is nothing particularly amazing about it (standard hotel room, outdated bathroom, no breakfast, no free parking) but it costs about $200 a night. The Fairmont Palliser, which is about two blocks away from the Hyatt, is a much nicer hotel experience for roughly the same price.